Only 5 left in stock! Dispatched same working day before 12pm. 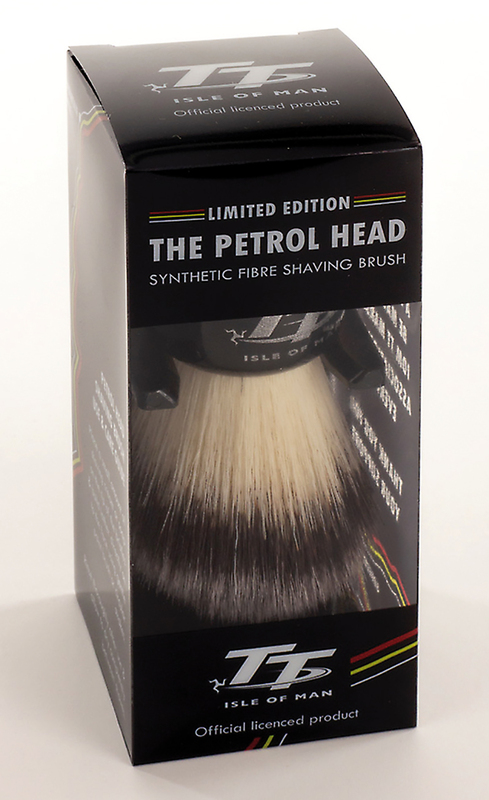 The Simpson Petrol Head IOM TT Limited Edition synthetic fibre shaving brush has been exclusively manufactured by hand on the historic Isle of Man, home of the world famous TT races. This brush pays tribute to the bravery of the riders who tackle the iconic & globally renowned Mountain Circuit. The brush comes finished with a highly polished gloss Black lathe turned handle, carrying the Isle of Man TT logo & filled with uniquely sourced synthetic fibre to deliver the smoothest of shaves. The brush is housed in a gloss Black drip stand which has a self adhesive backing so storage is made easy in the bathroom. The brush can hang from the drip stand to allow excess moisture to drain off. Presented in it's own Limited Edition box carrying the outline of the world's most famous motorcycle course, this brush is the perfect gift for any biker or motorsport enthusiast. A donation will be made to the Isle of Man TT Marshall's Association for every brush sold. This might well prove to be the closest shave you'll ever have at the Isle of Man TT!! !